It pays to make a statement in a home’s living room, which carries the responsibility of shaping a guest’s first impressions. This high-traffic room walks the line between durability and style, made all the more eye-catching with liberal doses of vibrant color. Read on for some of our favorite colorful living rooms. Packed with complementary counterpoints, this living room designed by David Herchik exemplifies the harmony of yin and yang. Sunny yellow sings on the floral area rug and at the windows, where drapery from Old World Weavers is accented with chocolate trim. Ivory-lacquered armchairs and a pair of cream-colored sofas keep the room’s palette light. Cool colors make a striking impact in this spacious living room. Walls are dressed in peacock-blue with simple white trim. A sitting area established by a geometric area rug features a quartet of chairs covered in “New Wave” fabric from Old World Weavers. Gilt stools and a wooden cabinet invite small doses of warmth into the room. See more of this colorful home here. An antique Oushak rug sets the stage for the warm palette in this living room, designed by Mark Ashby and Mary Ames. The diverse sitting area is composed of furniture dressed in soft chartreuse, butter yellow, and light oatmeal for a casual feel. The rich golden wall paint allows the room’s lighter elements to stand out, while the heavier tones—like the dark barley twist-style chair legs and steel-gray sofa pillows—create subdued contrast. See more of this idyllic Southern mansion. A sofa and pair of chairs are slipcovered in colorful calico to spice up the living room’s soft green palette. The lively sofa pillows from Pierre Frey draw the more vibrant colors out from the sofa’s chintz to complement the pattern. “Glade Green” wall paint from Benjamin Moore establishes the relaxing mood of the space, while rustic details like an antique wooden chair and Old World oil painting lend historic charm. See more of this Ozarks Getaway here. The tried-and-true color scheme of white-and-blue gains extra mileage when paired with florals and stripes of varying sizes. “We played with scale on the fabrics and used mitered stripes so this version of blue-and-white would have its own signature,” says designer Kelley Proxmire. Crisp white-painted woodwork throughout the room contrasts with the rich wood of the furniture. Farrow & Ball's sea-color "Plain Stripe" wallpaper brings classical elegance to the living room's cheerful palette. Two green bargellolike patterned settees face each other in front of the creamy white fireplace. Colorful pillows in fuscias and greens add color, comfort and pizzazz to the setting. The shocking hot pink of this formal living room partners perfectly with lime-green cotton-linen blend armchairs and a round ottoman in a coordinating botanical print. Pink-and-white batik draper panels and a geometric rug in similar hues imbue the room with a youthful vibe. For heft and a masculine touch, the fireplace surround was finished in glossy black paint. 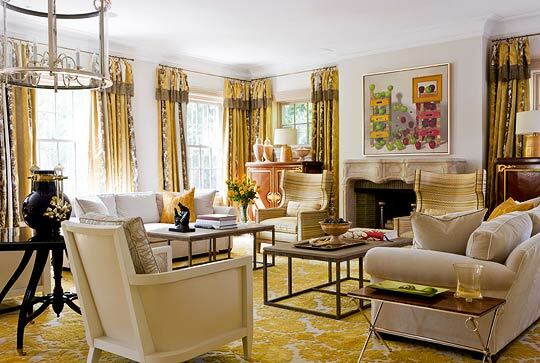 A green sectional sofa topped with pillows in sunny shades of yellow and apricot reflects colors in the bold artwork. Equally charming, one piece is a folk-art painting of furniture and the other a three-panel contemporary series showing blocks of shades in three color families. Seafoam green walls are brightened with white moldings. Bright yellow-orange walls, a chocolate-brown velvet sofa, and a fuchsia velvet armchair provide a vivid base for this living room's youthful personality. Pillows add an extra punch of color, while a zebra-print rug offers an intriguing pattern underfoot. Luscious teal-blue silk drapes on arched wrought iron rods soften this living room and complement the L-shape sapphire blue sofa and chocolate chenille armchairs. Above, hand-blown glass baubles in shades of blue adorn a chandelier designed by Helene Aumont. And on the far wall, large plaster remnants, salvaged from a ceiling in a French castle, add tone-on-tone texture. A clear kelly green enlivens this living room, seen in the window treatment, the chairs, and the custom rug, as well as in the accents. One of the primary sources of green--the fabric on the draperies and the club chair--features a green pattern on an airy white ground. The most concentrated doses of green appear on a striped fabric on the pillows and on the geometric pattern on the pair of wing chairs. All the green stands out against the neutral walls and the raw white silk of the sofa flanked by the two white consoles. Coral draperies from Silk Trading Company add ribbons of rich color to this living room. Armchairs in the foreground are covered in a coral linen by Schumacher. Lacquered, metallic, glass, and other high-gloss finishes--on tables, lamps, and even the red-painted Louis XIV side chair--reflect artificial and natural light, keeping the room bright and vibrant night and day. Andy Warhol's multihued homage to Marilyn Monroe seems perfectly at home among this room's traditional furnishings, bright Prussian blue walls, and soft-green upholstered furniture. White-painted woodwork makes the colors pop. Vibrant colors and patterns breathe life into this traditional living room's neutral backdrop. A multicolor serape rug inspired the decorating scheme that also includes a comfy chair covered in Colefax and Fowler chintz, a red-plaid wing chair, and a matched set of red chairs with animal-print pillows. This living room's walls feature a horizontal strié pattern that evokes the feel of raw silk and is executed in three congruous tones of apricot. Equally color-drenched pieces of furniture include a rust-color linen velvet soft and chairs regally upholstered in green-and-ivory cut velvet. A handsome palette of navy blue and rusts adds warmth to this north-facing living room. A sofa in rust-color mohair anchors a grouping that includes Bentwood chairs, tufted black vinyl chairs, and faux bamboo side tables. The walls boast navy paper-backed silk fabric that recedes against elaborate window dressings--pinch-pleated panels of rust-color wool appliquéd in velvet and blanket stitched in cream. Two red wing chairs covered in vintage-inspired floral fabric contrast with walls wainscoted in taxicab yellow. Beneath, a colorful rug in cornflower blue and red draws the whimsical color palette together. Clear raspberry, lime green, and hot pink create a parade of color in this long living room anchored in neutrals. In the foreground, floral-print chairs point toward an ottoman upholstered in a Manual Canovas pink-lime-yellow stripe. See next slide for a close-up of the hot pink grouping at the far end of the room. Four hot-pink Designer Guild velvet chairs radiate around a similarly striped pouf in a living room decked out in high-energy raspberry, lime green, and hot pink. With walls sporting a strong yellow-and-white-striped Cowtan and Tout wallpaper, this living room is grounded by the green rug with a trellis motif. 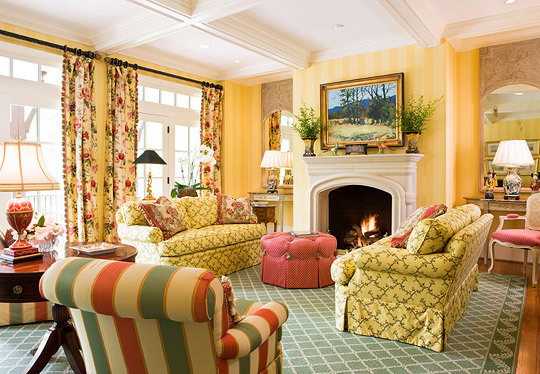 Spirited fabrics show up in pairs--on facing sofas in front of the fireplace, in stripes on armchairs flanking a round occasional table, and on floral drapery panels that dress sets of French doors. The coral ottoman in the center of the room is a solid star. An unexpected gray milk paint applied to the paneling and moldings creates a quiet envelope for a mélange of modern furnishings punctuated with taxicab yellow. Centered against the room's multi-pane windows, a raw linen sofa with accent pillows in stone, yellow, and bright, luminous blue captures the main focus. Elegant drapery panels in a gray-and-white burnout floral pattern unite with the other jolts of yellow thanks to yellow grosgrain trim pierced with silver nailheads. Curry-yellow silk draperies and peacock-blue velvet stools add splashes of color, while black accents keep the room anchored. The quiet gray on the walls was custom-mixed to match the door at the Christian Dior store in Paris, a beautiful creamy gray with hints of brown.